Inaugurated in 2008, the festival has developed over the years, and when the 2013 edition was held on Tuesday, March 26, the usual high standard was maintained. With renditions such as âShout to the Lordâ, âMajestyâ, âLord I lift your name on Highâ and âThe Right Hand of Godâ, among others, the students thrilled their peers. To crown off the day’s activities, some of the teachers of the school showed they are not only about chalk and talk and giving instructions, as they too took to the pans, and belted out a medley of choruses. Easter on Steel followed on the heels of the school’s music festival of song, dance and instrumentals, held at the New Testament Church at Wilson Hill, the previous Friday, under the theme âWith praise unto his glorious nameâ. The school’s musical director, Kesslon Wilson, who developed both festivals, noted that both brought out the multiple talents which exist at the institution. Wilson said that since its inception, the Easter festivals have unearthed some latent abilities of many students. 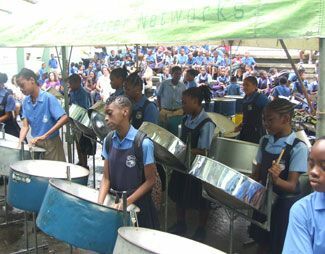 The pan festival was first introduced as an outlet for the students who play the steel pan as part of their music programme.